As a brewpub, 4 Mile surprises by its degree of experimentation that you would expect more from the eccentric breweries in industrial areas like Storm Brewing. Actually, calling it “Storm Brewing, but if it became 15% more conventional and settled down in an old suburban watering hole,” is an apt description for 4 Mile, and if none of that intrigues you, we understand. But if it does, you’ll find much to enjoy: a Rice Pudding Porter, a Cactus Grapefruit IPA, a Candy Bar Porter, and a Sweet Potato Harvest Beer, among many others that are fairly well distributed to liquor stores in Greater Victoria, with some penetration into Metro Vancouver. Some are one-dimensional but many are great and none are terrible. 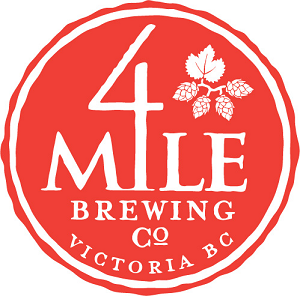 If you don’t like Storm Brewing and aren’t interested in kooky flavour beers you might be disappointed by the conventional offerings (which are fine enough), but 4 Mile isn’t afraid to challenge themselves to make eccentric ideas work. And it’s a delightful locale to visit: a comfy space with private TVs that allow you to enjoy whatever oddball program you want to pair with your oddball beer, with food is a step above the standard pub fare that likely graced the 150-year-old Tudor building for much of its existence. That, plus the 8-12 beers on tap at any time, ensures a memorable experience, even if the type of beers aren’t necessarily your cup of tea. It’s obvious that the present space is a result of a succession of business models, or at least of disorganized mishmash of ideas. And for ostensibly being a suburban brewpub/sports bar, it’s clear the beer is more a labour of love than a way to increase margins: prices are cheap and tasters vary by only a nickel at times, presumably from the actual difference in costs. Its old watering hole aesthetic may not inflate your expectations, but the care doesn’t go unnoticed: 4 Mile is a place that does something offbeat, and does it well.